A group of College of Law LL.M. students recently traveled to Albany to visit the State Legislature and meet with key participants in the state legislative process. LL.M. 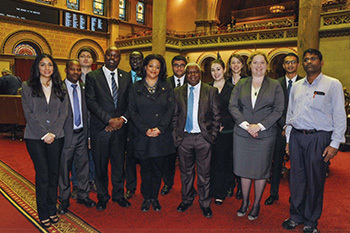 students pose with State Assemblywoman Pamela Hunter, center, during their visit to Albany. The group began the day meeting with New York State Assembly member Pamela J. Hunter. She discussed her time in office and answered their questions about state government. She then introduced the group on the State Assembly floor. Following their visit to the assembly, the students toured the New York State Court of Appeals and met with John P. Asiello, chief clerk and legal counsel to the court. The students ended their day with a visit to the New York State Bar Association (NYSBA), where they had a chance to tour the headquarters and visit with NYSBA President David Miranda. Miranda and his staff offered the students information about the largest voluntary state bar association in the country, including its ties to the international legal community.